It will never be necessary to reduce the level of the national debt! 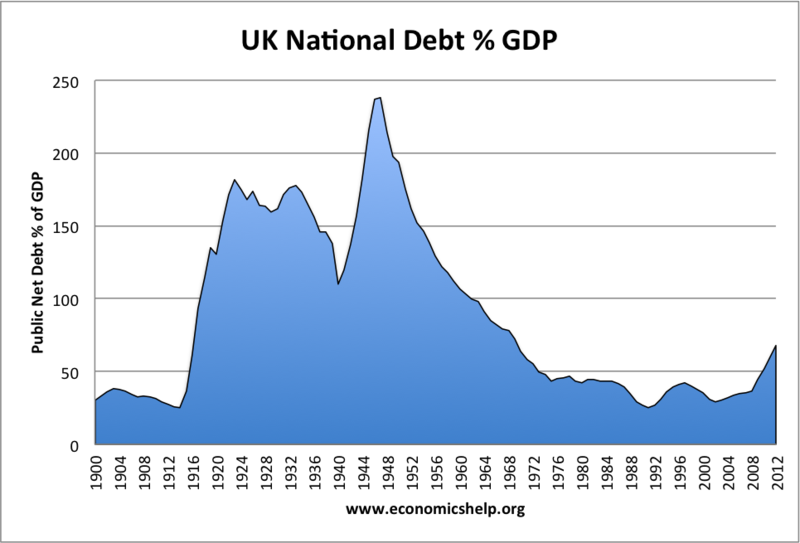 The above graph shows the UK national debt is now much lower than it has been in the 1940s relative to GDP, but the analysis of an “unorthodox post-Keynesian” economist, Warren Mosler in his book “Seven Deadly Innocent Frauds of Economic Policy”, who once stood to be US President shows that a central bank (such as the Bank of England or US Federal Reserve) doesn’t need to pay back the national debt to anybody who has lent money to it even when gilts/bonds mature, because the money remains at the bank in a different account! UPDATE (31/10/13): This article is misleading, mainly because Warren Mosler’s analysis does not take inflation seriously (see these 1-star reviews at Amazon). I have now written a review of that book and published it on this blog at https://thatcheroftheleft.wordpress.com/2013/10/31/review-of-warren-moslers-the-7-deadly-innocent-frauds-of-economic-policy-and-prospects-for-socialist-revolution/. Is MoneyWeek’s “End of Britain” just fearmongering? What about US debt default? Is socialist revolution on the cards? The financial magazine MoneyWeek is continuing its slick advertising campaign, with its prediction of “The End Of Britain” (inevitable social and economic chaos in the UK), with a video (viewed preferably on YouTube since the video on their website doesn’t allow rewinding or fast-forwarding, a sign of untrustworthiness) or in text form (with graphs) as a “letter” at http://moneyweek.com/endofbritain/. I argue below that, while some of their arguments are false or biased, socialists should recognise the validity of some of their other arguments and be prepared for the opportunities that will open up.